Winter is alive and well in Åstorp. The neighborhood looks like a scene from a children’s mythology book, driving the point home: THIS – Sweden – is the real deal. Nothing fabricated, duplicated, or imitated. I’ve been overwhelmed by the history of the country. Helsingborg is, and likely will be, the largest city in Sweden that I visit during this stay (I’ll devour Stockholm in August or September when I return). My experience has been in small coastal towns and on vast acres that aren’t overly developed or internationally homogeneous in appearance. I’ve rarely witnessed anything that’s conjured a feeling of familiarity or made a remark about how I’m reminded of x or y in the United States. I feel American in Sweden; it’s a sensation of being a naïve teenager. Because me, with my flashy 1776 wearin’ history, is just so funny compared to Sweden’s 1397 swagger. That swagger has a poise and calm that I simply don’t possess. I learned to identify this difference as lagom. (If there’s any word in Swedish you should know in addition to fika, it’s lagom.) Like much of the language, lagom has several definitions but the best sense of the word in English is “balance.” It’s with everything even that Sweden has maintained its internationally recognized culture of gender equality, the truth of which I can vouch on a day-to-day basis. There’s a way of being and communicating among women and men that’s level; it doesn’t matter if it’s a man or woman performing a job or raising a child. Is the task accomplished or the child well cared for? That’s what matters. Just right. Lagom. And it’s to this that I attribute my bold declaration from my previous post about Swedish children being better behaved than those in the United States. I’ll modify that statement slightly because since making it, I’ve in fact seen a few kiddo meltdowns while out and about (hey, kids are kids in any country) but seriously…let me give you an example. The first weekend I was here, AnnaKarin and I were at IKEA, feasting on meatballs, mashed potatoes, and lingonberries in the store’s cafeteria. IKEA: the place that evokes an anxiety attack from just the thought of it. I sat for an hour among at least a couple hundred kids who were eating lunch with their parents. NO ONE screamed or cried. NO ONE. Children conversed with their parents, parents laughed with their children. I honestly wondered what planet I moved to. And I’ve seen this time and again over my two plus months here. 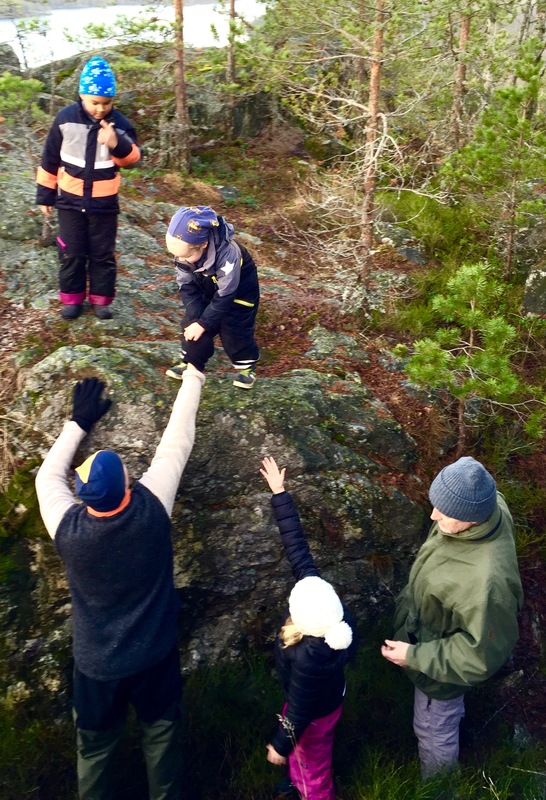 Children play an equal role to adults in the Swedish societal dynamic. The only titles that are formally used for adults by children are “mama,” “papa,” “grandma,” and “grandpa.” Aunts, uncles, teachers, neighbors, etc. are all addressed by first name from the moment a child can speak. Everyone here is an individual and is treated with the same respect. I mentioned to AnnaKarin and her friend this week that I’m surprised when a parent shares with me that she was just disciplining her child; from body language and tone of voice alone, it sounds as if they’re just discussing that evening’s dinner menu. Here’s the deal: I don’t have babies and have barely a clue as to what it takes to raise one, let alone many. But I’m struck by what peace, priority, and respect do for relationships, within the home and in society. It’s impressive. It’s made an impact on me. What I’m now eating thanks to Sweden. Awesome. I love what you said about the kids and parents showing equal respect for one another. What a beautiful thing. I try to do that raising 5 teens and a 4 year old. It’s not an easy job! Much respect for them!